Creature Caves An active community complete with forums! Includes Creatures and Creatures 2 plus all expansions for both. Wikipedia details the various editions/bundles and their differences. The GOG.com version comes pre-patched to version 1.04. 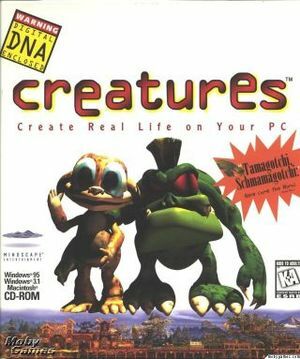 Creatures Remastered Patch Adds support for official and third party addon0installers/development tools to The Albian Years, Creatures Exodus and Creatures Village titles. 1.04 Update Some people have problems with this update, so feel free to stay on 1.02. The GOG.com version comes with all official DLC. A COB is a Creatures Object - an object in the game for either Creatures or Creatures 2, in Creatures 3 COBs are known as agents. CREATURES UNIVERSE has a ton of COBs! You can adopt Norns that have been exported from other player's games. Converts your creatures into a format Creatures 2 can read allowing you to export your creatures from Creatures and then import them into Creatures 2. As the game runs in a window it will expand as much as needed. The game only supports windowed mode. This page was last edited on 20 April 2019, at 01:43.